Ultrasound-Fluoroscopy Registration in Prostate Brachytherapy. 1 Ultrasound-Fluoroscopy Registration in Prostate Brachytherapy. Prostate brachytherapy is a treatment for prostate cancer using radioactive seeds that are permanently implanted in the prostate. The treatment success depends on an adequate coverage of the target gland with a therapeutic dose, while sparing the surrounding tissue. Since seed implantation is performed under transrectal ultrasound (TRUS) imaging, intraoperative localization of the seeds in ultrasound can provide physicians with dynamic dose assessment and plan modification. However, since all the seeds cannot be seen in the ultrasound images, registration between ultrasound and fluoroscopy is a practical solution for intraoperative dosimetry. 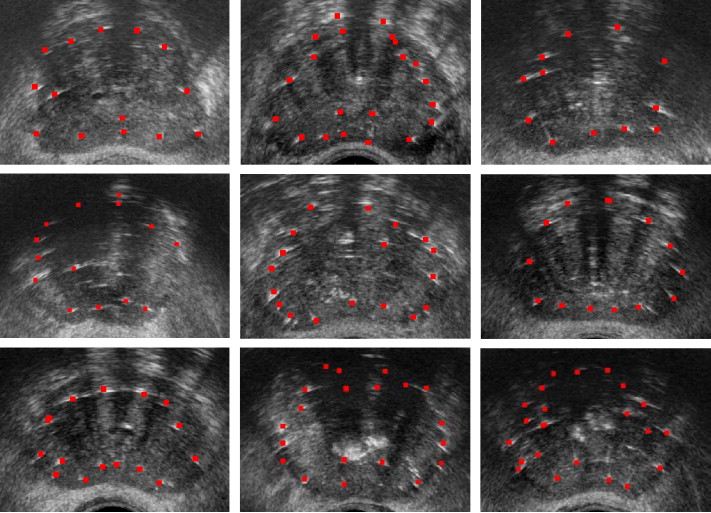 We introduce a new image-based nonrigid registration method that obviates the need for manual seed segmentation in TRUS images and compensates for the prostate displacement and deformation due to TRUS probe pressure. We envision the following workflow for providing intraoperative dosimetry analysis and optimization using ultrasound-fluoroscopy registration. At some point during the operation or immediately at the end, the physician acquires a series of transverse TRUS images of the prostate by continuously retracting the probe from the prostate base toward its apex (see fig 1a.). Since some of the seeds may be located superior to the base or inferior to the apex, it is recommended that the whole range be covered during image acquisition. These slices are concatenated into a volume that is used for registration (fig 1b.). After acquiring TRUS images, the physician fully retracts the probe. Then several C-arm images are taken from different angles (fig 1c.). These images are processed for distortion correction and seed segmentation (kuo et ak., 2012). The seeds are reconstructed in 3D space from the processed C-arm images (fig 1d.) and are registered to the TRUS volume (fig 1e.). After registration, the dose distribustion is calculated and the isodose contours are overlaid on the TRUS images. At this stage, the under-dosed regions (cold spots) or the regions with high risk of over-radiation can be detected. The physician can change the planned position of the remaining seeds and add new seeds, if necessary, to compensate for possible errors. Figure 1: The workflow for ultrasound-fluoroscopy registration. (a): Several transverse images of the prostate (b): A volume created from the slices. (c): Several C-arm images taken from different angles. (d): Seeds reconstructed in 3D. (e): Registered seeds overlaid on the US volume. Seeds are shown as capsules. We tested our registration algorithm on a CIRS-053 prostate brachytherapy training phantom (CIRS Inc., V.A, USA) implanted with 48 dummy seeds. In order to establish a ground truth, the phantom was imaged using CT. The phantom box was equipped with 6 fiducial beads visible in CT images (see fig. 3) The seed clusters were segmented in the CT volume by thresholding. The center of mass of the seed clusters were grouped into a set of points similar to the outcome of seed reconstruction from C-arm images. The relationship between the seeds and the beads (manually localized in CT images) provided the seed positions in the phantom coordinate system. We evaluated our algorithm on clinical data sets acquired from 10 patients. We tested our registration algorithm in rigid and affine modes. Figure 5 shows some of the results form the tests and as it can be sen, there is an excellent visual agreement between the bright spots in the images and the registered seeds. Fig. 6 shows two mid-gland images of the prostate for patients 2 and 5, overlaid with seeds resulted from affine and rigid registrations. The true positions of some identifiable seeds are marked with arrows in these figures. As it can be seen, the affine registration method results in a better visual agreement between the real and the registered seeds. The affine registration performed better than the rigid registration method in regard of seed-to-seed registration error. We also conducted a dosimetry study on nine of the patients for whom postimplant prostate contours and CT images were available. In order to calculate the delivered dose to the prostate, an experienced radiation oncologist delineated the prostate in the postimplant TRUS and Day-1 CT images. We calculated the delivered dose using the seed positions obtained from rigid and affine ultrasound-fluoroscopy registrations and the postimplant TRUS prostate contours segmented in Day-1 CT as well. We computed and reported two important dose parameters: V100 and D90. The former is the percentage of the prostate volume covered with 100% of the prescribed dose and the latter is the percentage of the prescribed dose delivered to the 90% of the prostate volume. For dose calculation throughout this work, we approximated the seeds as point sources (Rivard et al. 2004). Figure 2: Clinical results: registered seeds overlaid on mid-gland slices of the prostate for nine patients. Overall, Our trials on a ground truth phantom showed registration errors of 0.84 ± 0.45 mm (mean ± SD) for initial alignment errors of ±15 mm along each axis and ±15° around each axis, despite the presence of false positives and missing seeds. In a trial on 10 patient data sets, our algorithm achieved overall registration errors of 1.5 ± 0.9 mm and 1.7 ± 1.0 mm for the affine and rigid registrations, respectively. The affine registration method succeeded in achieving an average registration error of less than 2 mm for all the patients. In a dosimetry comparison with Day-1 CT for 9 patients, our registration results showed prediction errors of 3.11 ± 2.06% and 1.70 ± 1.42% for V100 in rigid and affine modes, respectively. It also showed prediction errors of 10.9 ± 11.7% and 10.5 ± 11.0% for D90 in rigid and affine modes, respectively, which were decreased to 7.5 ± 6.2% and 7.0 ± 3.8%, after removal of an outlier. A paper “Ultrasound-Fluoroscopy Registration for Intraoperative Dynamic Dosimetry in Prostate Brachytherapy” was developed which uses the technology of the Ultrasound-fluoroscopy. What dynamic dosimetry aims to do is to localize the true position of the seeds inside the tissue, calculate the delivered dose, and adapt the implant plan accordingly to compensate for seed placement deviations in the operating room. While Ultrasound and fluoroscopy are not generally used for this specific application, but the seed implantation inside the prostate changes the ultrasound images because the metallic seeds are hyper-echoic, resulting in bright regions in the ultrasound image that correlate with the C-arm reconstructed seeds. Ultrasound-Fluoroscopy techniques ultimately make Dynamic Dosimetry possible. In this paper we introduced a new nonrigid image-based ultra-sound fluoroscopy registration method. It provides a practical solution for dynamic dosimetry in prostate brachytherapy. Gaussian blurring is used to enhance the quality of the TRUS images and prepare them for registration. We used a computationally efficient point-to-volume similarity metric and a stochastic evolutionary optimizer within our registration loop. In summary, our image-based ultrasound-fluoroscopy registration method is capable of providing accurate registration and dosimetry results within a clinically acceptable time frame. In contrast to previous work, it is able to account for prostate motion and deformation caused by the probe retraction and also perform the registration without a need for manual seed segmentation. 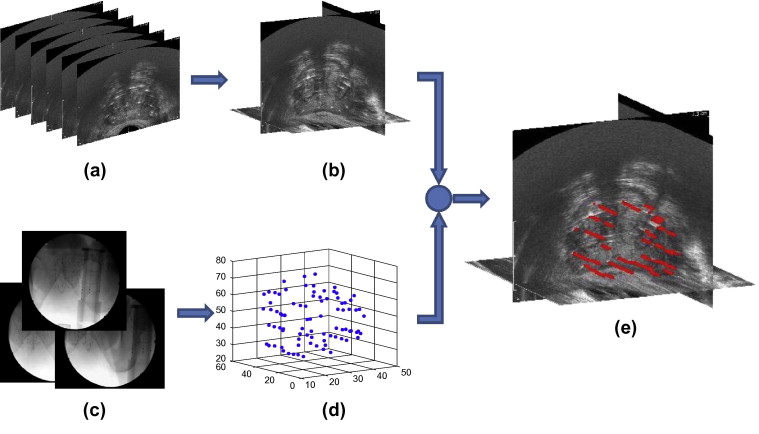 Considering the results, our algorithm is a promising method for providing dynamic dosimetry and improving prostate brachytherapy treatment quality. E. Dehghan, J. Lee, Pascal Fallavollita, N. Kuo, A. Deguet, Y. Le, E.C. Burdette, D.Y. Song, J.L. Prince, and G. Fichtinger, "Ultrasound-fluoroscopy registration for prostate brachytherapy dosimetry", Medical Image Analysis, 16(7):1347-1358, 2012. E. Dehghan, N. Kuo, A. Deguet, Y. Le, E. Armour, E.C. Burdette, D.Y. Song, G. Fichtinger, J.L. Prince, and J. Lee, "Ultrasound-Fluoroscopy Registration for Intraoperative Dynamic Dosimetry in Prostate Brachytherapy", Abdomen and Thoracic Imaging, 587-621, 2014. E. Dehghan, J. Lee, P. Fallavollita, N. Kuo, A. Deguet, E.C. Burdette, D. Song, J.L. Prince, and G. Fichtinger, "Point-to-volume registration of prostate implants to ultrasound", 14th International Conference on Medical Image Computing and Computer Assisted Intervention (MICCAI 2011), Toronto, Canada, September 18-22, 2011., . M.J. Rivard, B.M. Coursey, L.A. DeWerd, W.F. Hanson, M.S. Huq, G.S. Ibbott, M.G. Mitch, R. Nath, J.F. Williamson, "Update of AAPM Task Group No.43 Report: a revised AAPM Protocol for Brachytherapy Dose Calculations", Medical Physics, 31(3): 633-674, 2004. This page was last modified on 25 August 2016, at 10:33.